Gaming has become a huge part of the pop culture landscape. They push us to compete, collaborate, explore, and learn. They reinforce who we are and who we want to be. Games are an avenue for self-expression, and gamers are passionate about their identity. 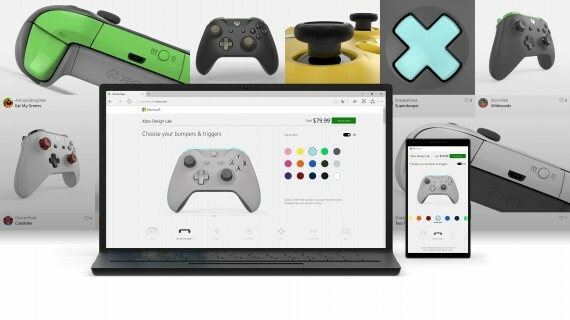 The Xbox Design Lab is Microsoft’s first build-on-demand program, and the customizable game controller is the first device we created for it. The controller is the most intimate connection you have with the Xbox. It’s the extension of yourself into the world of the game. With the Xbox Design Lab, our challenge was to make that connection even more personal. We wanted to let gamers express who they are through the Xbox controller, the physical manifestation of their digital gaming identity. This was no small undertaking. As Microsoft’s first ever build-on-demand program, Design had to help figure out how to bring 30+ teams together into a brand-new organization. There was no template, no roadmap. The initial challenge was to create a vision, and then design the organization necessary to make that vision a reality. We considered the creative process from our perspective as interaction designers. Like the sequence of steps, starting with the big elements and driving toward details like the triggers and buttons, while making it easy to backtrack and try new things. We attend to the details, like using live-rendered 3D (WebGL), so that you can see your entire composition. This is significant – it helps you see how all the decisions you’ve made are working together. We’re continually working with testers in the lab and gamers in the community to incorporate their feedback into the Xbox Design Lab experience. We’ve added unique angles and a histogram to express people’s designs in new and interesting ways. The Xbox Design Lab is about encouraging gamers to express themselves and share it with the world – letting them embrace Xbox as part of their identity. The experience is getting love on social media and our fans are creating things we’d never have thought of. As designers, we’re used to telling Xbox stories, but the Xbox Design Lab is about gamers telling their stories.